If you like a restaurant with a story and the food to have some meaning besides being delicious, AnnaMaya is the place for you. Andaz Hotels by Hyatt are all about showcasing the local culture of the cities that they are located in, alongwith creating vibrant social areas and serving locally inspired cuisine. 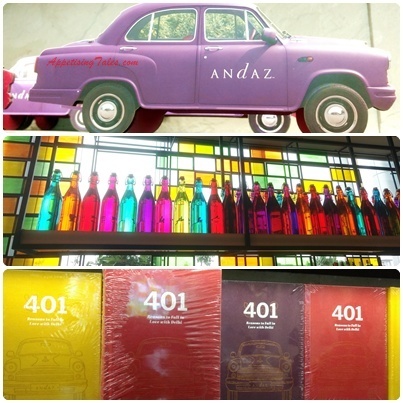 Living up to this philosophy, AnnaMaya the European-style Foodhall is Andaz Delhi’s 24-hour multi-cuisine offering. The high-ceilinged space is flooded with natural light streaming in through panels of coloured glass and is split into varied seating areas, breaking up the expanse of this 200-odd seater restaurant. The well lit interiors; rock salt grinder; microgreens. When you visit for the first time you’ll most likely be taken on a tour that starts by explaining why it is called a foodhall - they retail a variety of merchandise that is procured locally for use in the hotel. You’ll thus find a range of natural millets, organic honey, flavoured salts and sugar as well as crockery, copper glasses, glass bottles and other qwirky bric a brac that are stocked up on various shelves all over the restaurant. The prices are only nominally higher than the MRP to cover the cost of the transportation. AnnaMaya also uses a large variety of organic vegetables that will be made available for sale shortly. “Eat Mindful. Shop Artisanal. Raise Awareness” is the tagline on the menu which is divided into three sections – Foodhall, Microgreen Farm and Tijara Organic Farm. Foodhall has specialties inspired by the flavours and diversity of India, made with native artisanal ingredients. Burrata with lime and honey, fire-roasted tomato with basil naan shows how local ingredients have been amalgamated seamlessly into an Indo-European dish. But don’t expect everything to be fusion fare; purists can tuck into a wide variety of Indian or European dishes such as kadhai paneer or Amritsari goat milk paneer tikka as well as linguini with asparagus snowpeas and poched egg or penne with burrata and a smoky tomato coulis. We try the luscious asparagus orzo that is made rich with a silken asparagus puree, enhanced with stewed Kashmiri morels. 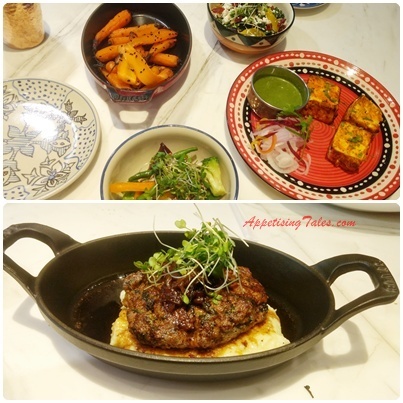 Top: Tijara Farm's organic carrots, Amritsari Goat Milk Paneer Tikka. Bottom: Succulent Lamb Patty with Timur Pepper. 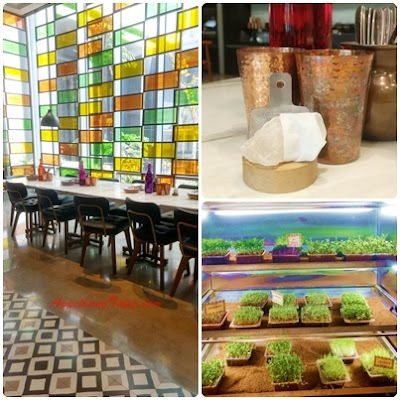 Microgreen Farm highlights the farm to table concept by using the microgreens that are grown in a temperature controlled environment at Andaz Delhi. The fresh cut aloe vera with microgreens is a delicious revelation of a unique way of using aloe vera. Then the pretty, crunchy greens not only beautify the butter baked garlic prawns, but also lend an inimitable freshness to this dish. One also finds them atop a juicy lamb and spinach patty that comes with a creamy mash and onion compote. The highlight of this plate though is the freshly crushed Himalayan timur pepper. This wonderful spice lends itself very well to gin-based cocktails as well and is available for you to buy! 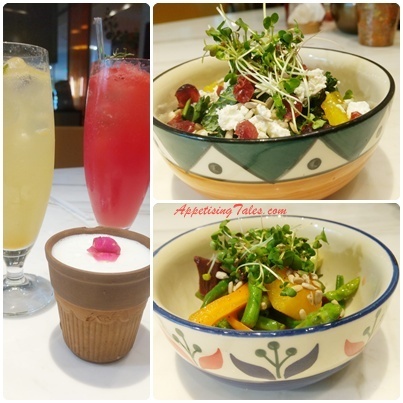 Refreshing Drinks and Organic Salads. And the last section of the menu uses vegetables grown at the Tijara Organic Farm in Rajasthan which is known for its organic and biodynamic farming practices. I have to admit that everything that we try from this selection is fantastic. Do try the slow roasted carrots, their natural sweetness is enhanced with Himalayan honey and contrasted with black onion seeds. The kale, mandarin and goat cheese salad is tied together with a lychee honey dressing and topped with melon seeds and red currants. And lastly the roasted new potatoes have a rustic appeal and flavour. We are informed that the crunchy zakiya seeds used in this dish, that look like small mustard seeds, are brought in from Uttarakhand. Chef Gordon with his Monster Shake. As is evident so far, the choice is extensive, food is delicious and largely organic. There’s an equally large choice of mocktails made with fresh juices, and flavoured lassis, leaf tea and herbal infusions besides a full-fledged alcoholic beverages. And finally we reach the dessert section. The attractive counter is placed right at the beginning of AnnaMaya and is laden with candy, gelato, pastry, meringue and more. The way to do justice to Chef Gordon’s creations though is to order one of his monster shakes. 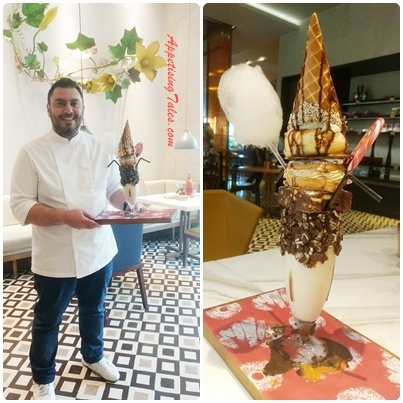 It is a shake topped with brownie, pastry, another pastry and gelato in a waffle cone, candy floss, lollipop and all of this is layered in between with chocolate sauce, crushed Oreo biscuits or brightly coloured Gems. This one’s definitely for folks with a sweet tooth and will delight kids and adults alike. Details: AnnaMaya, Andaz Delhi, Aerocity, New Delhi. This article first appeared on travelandleisureindia.in on June 5, 2017.